Officials Find A Mass Grave In Mexico The burial site contains at least 166 skulls and more remains may be uncovered. But family members of people who disappeared are distrustful of how the site is being managed. 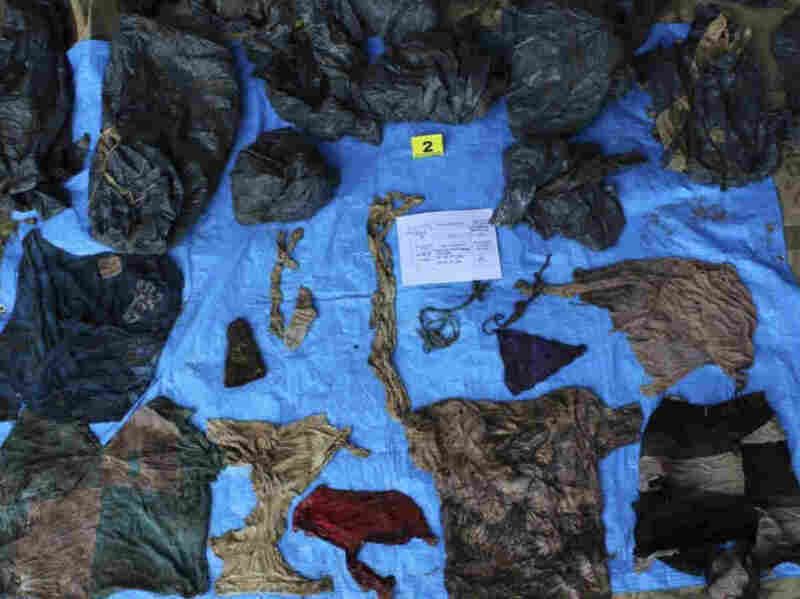 Mexican investigators found 200 garments at an undisclosed grave in the Gulf Coast state of Veracruz. The bodies were buried at least two years ago, Attorney General Jorge Winckler said Thursday. Since that time, investigators uncovered at least 166 skulls, he said. They also found 200 garments and other personal items, including more than 100 IDs. More may be uncovered. Winckler would not disclose the location of the graves, citing unspecified security reasons. Investigators located the remains with drones and radar. The bodies were buried at least two years ago, he said. His office did not immediately respond to NPR's requests for comment. More than 35,000 people have disappeared in Mexico — including nearly 9,000 women and 6,300 minors, according to the National Registry of Data on Missing and Disappeared Persons. This burial site is not the first mass grave uncovered in the state of Veracruz. Two years ago, family members grew frustrated with government inaction and took it upon themselves to search for loved ones. They found more than 250 bodies buried in an abandoned lot. Griselda Barradas, the mother of a young state investigator whose remains were identified at the site, told NPR's Carrie Kahn, "My son thought he was going to clean the country of these bad people. But no, instead they got rid of him." Winckler told media that site was likely used with the complicity of state officials. Many of the state's mass graves are thought to be tied to the former governor, Javier Duarte. He was extradited from Guatemala to Mexico, and now sits behind bars while he awaits a trial on corruption charges. "This is the latest confirmation of the degree of impunity drug gangs operated in Veracruz during Duarte's government. He allowed this to happen," Maria Elena Morera, the head of an advocacy group called Causa en Común, told the The Wall Street Journal. Veracruz is also home to one of Mexico's biggest and oldest ports, and drug gangs such as the Jalisco New Generation Cartel and Zetas have waged bloody battles to control the territory. Winckler said Thursday that relatives of people who disappeared were not invited to participate in the August search "for security reasons and to guarantee the success of the investigation." Instead, he said, they will be shown a catalog with photos of items recovered from the grave to help them identify victims. That decision has upset some family members of people who went missing. "I don't trust the attorney general, the agency," activist Lucia Diaz of the Mexico-based Colectivo Solecito told NPR. She said she believes that 166 bodies cannot be excavated properly in a short period of time "without the help of the federal police." Winckler did not assist them as they spent two years excavating the other Veracruz grave, digging five days a week, she said. "There is a history of bad relations between us because he's isolated us, he doesn't talk to us – the mothers."